Caesarsweed, photographed at Loxahatchee National Wildlife Refuge, Boynton Beach, Palm Beach County, in January 2015. Caesarsweed, Ureba lobata, is the blacksheep of the mallow family. In parts of the world where it is native, including Africa, Asia and South America, it is extremely an extremely useful plant. But in other places where it's found a home, including much of the Pacific and Florida, it is an unwanted guest, an invasive pest that drives out native species and takes over fields. 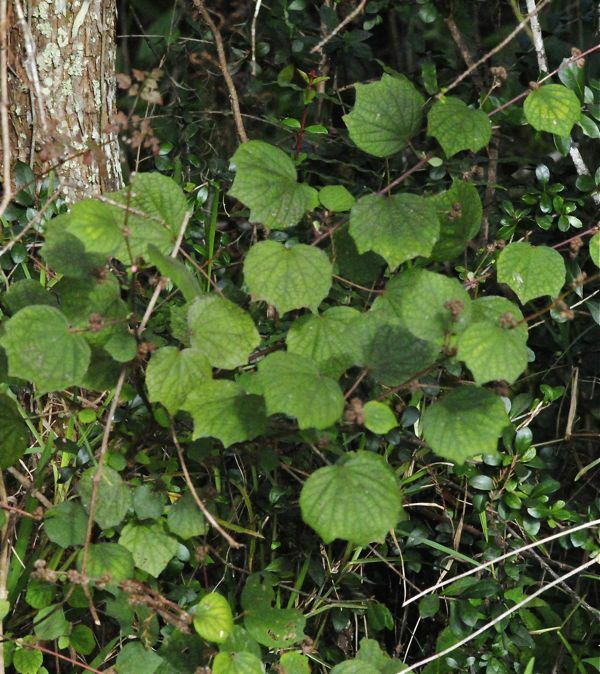 It is listed as a noxious weed in Hawaii and a category I invasive in Florida. Caesarsweed, also spelled Caesar's weed or Caesars weed, is a shrub that can reach 10 feet in height. It grows in disturbed areas, such as roadsides and old fields, but we've also seen it growing in hammocks. Its bark is smooth, but fibrous and tough, and the plant is used in Africa and Brazil to make jute. The leaves usually have three shallow lobes on the end that give them a crest- or shield-like shape. The flowers are pink, with five petals and a throat that approaches red. It's pretty enough, but tiny compared to those of its native cousins. On the plus side, it does hold soil well, so it's useful for erosion control, and its branches and foliage provide cover for wildlife. Where Caesarsweed is native, the locals make extracts from its leaves and roots to treat colic, gonorrhea, malaria, fevers and wounds. Some scientific tests show ceasarsweed leaves to be 86 percent as effective as aspirin as an anti-inflammatory. In Africa, it's eaten as a famine food. However, caesarsweed is quite capable of forming thickets, and when it grows in pastures, livestock won't touch the stuff. This is how it's described in Fiji: "It is a pernicious weed abundantly naturalized in gardens, canefields, pastures, clearings, and grassland, and also found along forest trails and on open hillsides"
In Florida, it's found throughout the entire peninsula and a few counties in the Panhandle. The Florida Exotic Plant Pest Council lists it as a category I invasive, meaning it's damaging habitat and displacing native plants. Caesarsweed is also found in Louisiana, among the lower 48 states. 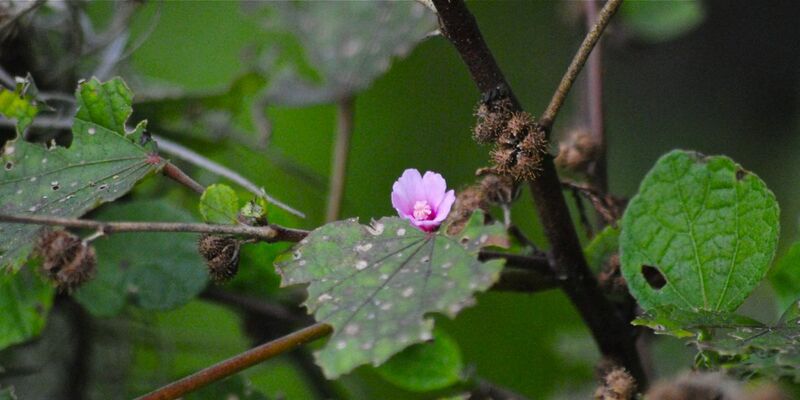 It is a member of Malvaceae, the mallow family, which includes all hibiscus species. 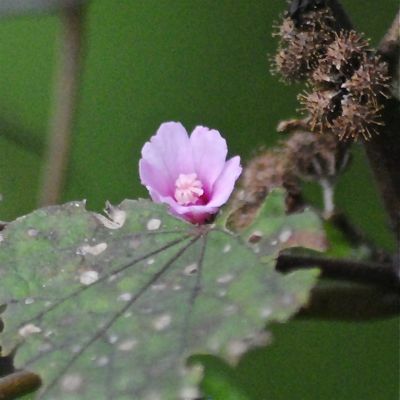 In fact, one of ceasersweed's other common names is hibiscus burr, a reference to its burr-like seeds (clearly seen in the three photos on this page).